Israel is not the first country one thinks of when discussing the world’s immigration problem. But it is a big issue in the Jewish State and it is becoming bigger. It takes an hour and a half to drive from the Mediterranean metropolis Tel Aviv to the Jordan River and the border with Jordan. It takes less than an hour to drive from Jerusalem to Tel Aviv. The population of Israel is 8.5 million. Therefore, 30,000 African refugees are a relatively big number. The refugees come from Eritrea – a particularly brutal one-party state – and Sudan, which is not much better. They have been entering Israel as asylum seekers over the past five years and have formed a community in the southern suburbs of Tel Aviv. Thirty thousand African refugees however does not fit in with Binyamin Netanyahu’s vision for the Jewish State and Homeland. So he set out to deport them. That did not fit in with the self-image of a tolerant and open society shared by many Israelis. They demonstrated. They marched and they appealed to the Israeli Supreme Court who overturned the deportation orders. So the Israeli leader took another tack. He organised for the Canadian, Italian and German governments to take the refugees. In return he would take one of their refugees for each Israeli/African refugee they took. This didn’t make any sense to the anti-migrant lobby who argued that that a refugee is a refugee wherever they come from. Now that policy has been overturned. 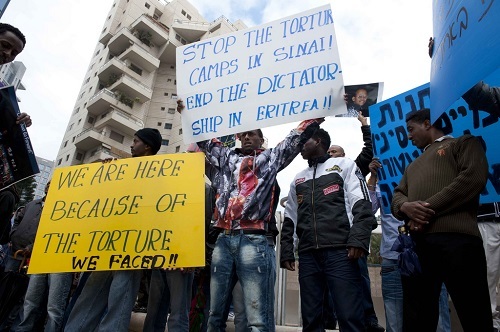 Netanyahu, however, is determined to be rid of what he calls “the infiltrators” and is now talking about sending them to African countries other than Eritrea or Sudan.